The whole antenna switching system is totally homebrew. 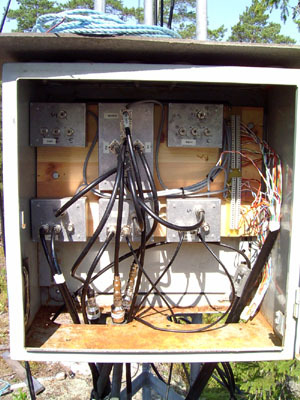 I decided to use a 6x2 switchbox up at the hilltop with two feedlines entering it from radio A and radio B down at the shack making SO2R possible. 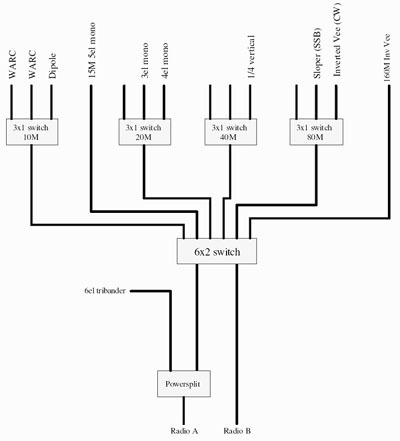 To make it possible with access of all antennas on both rigs I made 3x1 switches for the bands needing more than one antenna and connected it to each port of the 6x2 switch. That way I can access whatever antenna I want on both rigs, as long as they arent on the same band. I also have a powersplit mounted down in the shack which makes it possible to beam in multiple directions since I split the power between the monobanders and the tribander. This is mostly done to always have a signal into Europe for keeping the freq clear and of course for working more stations. 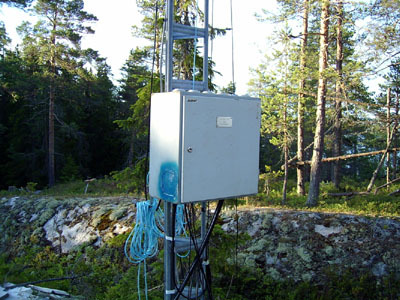 Band decoders are used for making antenna switching easy and also for switching BPFs. 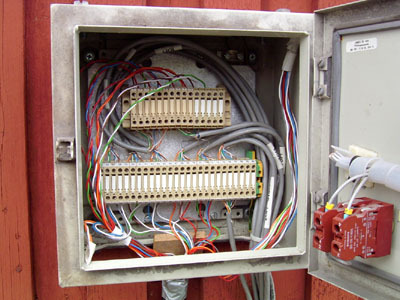 There is a 60-wire cable going up the hilltop that is used to switch all the different switches at the station. 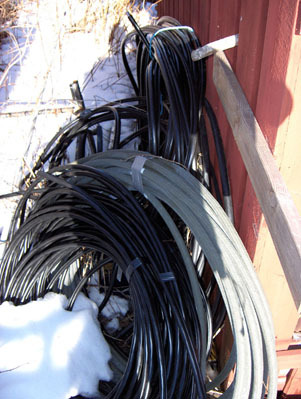 I have used RG213 cable in all the towers and have used RG17 with a metal protection around it between the towers and the long coax run down to the shack. There is a total of 500m RG17 at the station, 100m RG213 and about 60m RG58. I used RG58 for the lowbands but that cable will be replaced with RG213 next summer. The distance between the shack and the hilltop is 200m, so I have a loss of 2.6dB on 10m, 2.2dB on 15m, about 1.8dB on 20m and on the lowbands it so little that	it doesnt matter much. Below you can see a schematic over the antenna system and also pictures of the crap mounted.